I was driving home and I had to put some wax on a sore spot. I didn't have a tissue or anything to dry my teeth and since I was going home to change anyway, I just used the bottom of my shirt (I know, eww!) Anyway, my shirt snagged on the bracket and I got a green light. I'm stuck with my shirt flipped up and I can't get it off my teeth! I had to pull over as soon as I could and get it untangled. Thank goodness no one saw me. Anyone else have an embarrassing story? Thankfully, after a few months, the spitting while speaking stopped. Now, I am so paranoid about it! I spit into people's food all the time, thankfully they don't notice and I just let it go. LOL. I feel sorry for the people around me. I was reading this post the other day, and i thought to myself, i dont really have any embarressing brace stories........until wednesday of this week!!! Let me set the scene for you a little. Every week i go indoor rock climbing with my brother. On this particular day i was lead climbing the overhang. 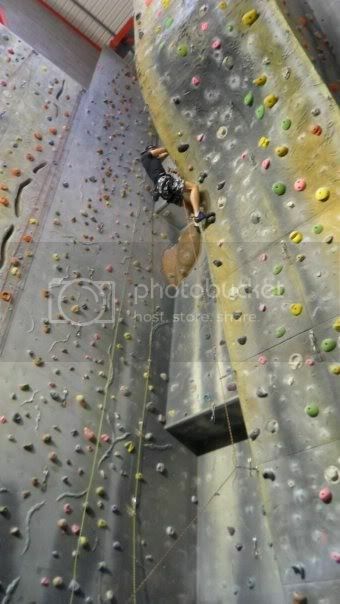 Lead climbing means climbing up a wall that has no rope on it, instead you have rope attached to you and ever couple of meters there is a clip to put your rope in to prevent you falling. In order to get the rope up you have to pull it from the ground with one hand and clip it in. I was about 13 meters ors so into an overhang climb, my arms already tired and cramping, im pushing myself to get to the next clip. as i tried to release the rope from my teeth it wouldnt. It had snagged good and proper on my upper brace. at first i was like, no problem, just unsnag it. But it wouldnt come off, i couldnt climbing any further, or fall of the wall as the rope would pull tight and rip the brace from my mouth. Heres a pic of me on the over hang, i was a little higher than this. martinboyce wrote: Ias i tried to release the rope from my teeth it wouldnt. It had snagged good and proper on my upper brace. at first i was like, no problem, just unsnag it. But it wouldnt come off, i couldnt climbing any further, or fall of the wall as the rope would pull tight and rip the brace from my mouth. OH MY!!! That would scare the crap out of me!!! I am glad that you are ok! 2 Years 4 months 3 weeks and 4 days in full metal braces! Click on "WWW" for my braces story! BRACEYOURSELF! wrote: I spit into people's food all the time, thankfully they don't notice and I just let it go. LOL. I feel sorry for the people around me. I teach. I got my braces a week before classes started.......I'll let you finish the rest of this story. Poor students finally started sitting in the first row again.